Tourism News – Summit Helicopters Pvt. Ltd.
Fishtail signs with the first Airbus Helicopters HCare Smart Contract to cover the fleet of two H125 (Previously named as AS350 B3e) for five years under the Airbus HCare Service offer. As we are the first company to introduce the H125 in Nepal, we will now be the first to take benefit from the HCare Smart Program in the contry. This contract will offer the support for both scheduled and unscheduled aircrafts events and entitles of Fishtail Air for full Material Management Service backed by a parts availability commitment. 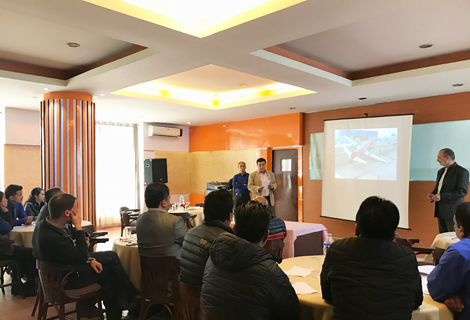 Fishtail can ensure high maintenance standards in collaboration with Airbus Helicopters and can meet growing demand for helicopters in Nepal. This offer provides the rotorcraft industry’s most comprehensive service coverage, grouped with 5 doamins: material management, helicopter maintenance, repair and overhaul (MRO) and upgrades, technical support, training and flight operations and connected services. It includes Repair by hour (RBH), exchange by the hour (EBH), parts by the hour (PBH) and full by the hour (FBH). The Himalayan Travel Mart 2017 is being held, from 1st to the 4th of June, 2017, with the aim to re-define Adventure Tourism and also establish Nepal, as a Gateway to the Himalayas. 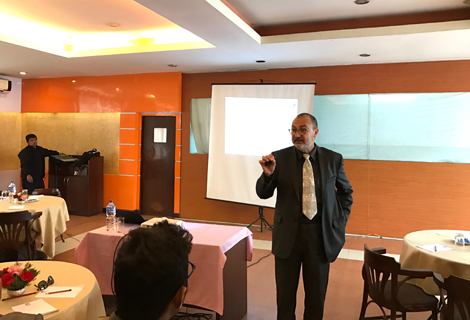 The event is being hosted by Ministry of Culture, Tourism & Civil Aviation (Government of Nepal) with the support of PATA International, NTB, Nepal Airlines Corporation and other pertinent Stake Holders. PATA Nepal Chapter is the Implementing Agent/Organizer for this historical event. It is a Business to Business Event; where Buyers from all over Europe, North America, South America, Australia, New Zealand, Russia & CIS, Asia and the Gulf, participate, with an interest in promoting tourism in Nepal and the Himalayan region. Fishtail is participating in Himalayan Travel Mart as it will flourish the local tourism of Nepal in different part of the world. Fishtail is engaging in this mart to grow up relation with different sellers, buyers and other customers and as well as establishing sustainable tourism throughout the world. Aerial work is one of the difficult action to perform in higher altitude which was performed by Fishtail air and has successfully completed on May 12, 2017 in Everest Region-Lobuche Glacier (4940m) and Gorakshep Glacier (5164m). 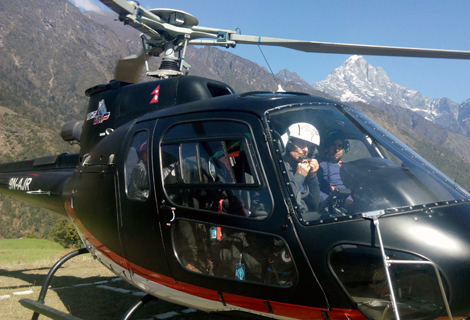 Our AS350 B3e (9N-AJQ) was piloted by Caption Maurizio Folini and supported by Technician Mr. Hari Giri for this action. This aerial work was for Glaciology Study. Sherchan‘s first record to climb Mount Everest was at the age of 76 on May 2008 and that record was broken by Japanese Climber (Yuichiro Miura) on 2013 at the age of 80. He headed up to Lukla from Kathmandu on April 2017 with Fishtail Air to regain his title as the oldest person to climb Everest once again. Mr Sherchan had left for the Everest base camp 30th April 2017, leading a seven-member team. Ueli steck was a famous swiss rock climber and mountaineer who won two Piolet d’Or, in 2009 and 2014. He is also famous for his speed records on the North Face trilogy in the Alps. He has won many awards regarding mountaineering in Nepal as well as in many countries. He died on April 30, 2017 morning while attempting the west ridge route of Everest. He slipped away from west ridge of Everest and fell 100m down from west ridge of Everest. He was there without supplemental oxygen. His remains were airlifted by Fishtail Air from Everest base Camp I this morning under the command of Captain Maurizio Folini. Captain Maurizio flew over the Everest Base Camp and landed at Everest base Camp I and was able to bring his remains back to Kathmandu. Fishtail Air Bagged the award for logging Highest Number of Flight Hrs (7800+) with AS 350 B3 Helicopter. 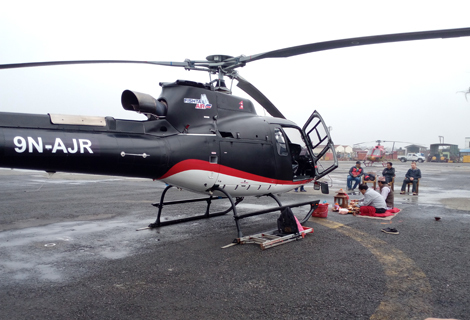 We pioneered the introduction of AS 350 B3 Helicopter in Nepal by importing two units in 2009, embarking to a new era of Heli Aviation in Nepal, followed by the presence of 15 such Aircrafts in our sky today. Within the span of less than 8 yrs, journey has completed a land mark 50,000 hrs of which Fishtail Air is the biggest contributor. 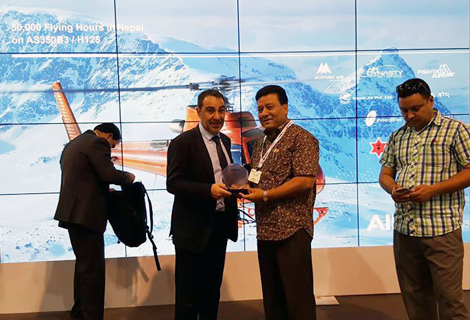 Amidst a function of “Rotorcraft Asia” today in Singapore, Philippe Monteux, Managing Director of Airbus Helicopters, SEA awarded Fishtail Air as the Top Operator along with others from Nepal. Fishtail’s new heli ‘9N-AJR‘ has officially started its first commercial flight by today (April 4, 2017). Flight to Gorakchep (Everest Region). This flight was under the control of Captain Eric Alexander Ridington and flew flawlessly over Everest Region. Today 9N-AJR has showed its capability to fly over Nepalese sky and will keep flying very persistently in coming days. 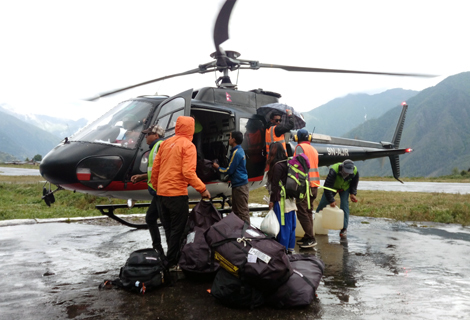 Along with this, we are planning to set one of our B3 helicopter in Lukla by second week of April which will definitely help and provide the best services to the climbers as well as for other missions in climbing season. 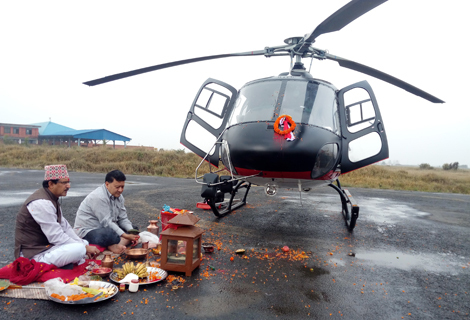 Fishtail Air’s Newest Heli is ready to operate in Nepalese sky! Fishtail Air’s most awaiting and featuring newest heli with a model of AS350 B3+ and call sign ‘9N-AJR’ with a capacity of flying up to 23,000 feet (AMSL) is ready to operate for its commercial fight (Aerial Survey, Sightseeing, Mountain Flights, Medical Evacuation, Corporate Charter, Human/Cargo sling Operations, High Altitude Operations and other special adventure missions. Fishtail Air now operates three helicopters AS350 B3e (9N-AJQ), AS350 B3+ (9N-AJR) and BELL-206 (9N-AII) on its fleets. Along with this, Fishtail Air is adding more two Bell 505 Jet Ranger X Helicopters within next year. Fishtail Air will be at best to serve and provide proper facilities to its clients.